The Haemonetics 250mL Anticoagulant Citrate Phosphate Double Dextrose (CP2D) and 250mL Additive Solution Formula 3 (AS-3) nutrient solution are intended to be used only with automated apheresis devices for collecting human blood and blood components. The anticoagulant solution is metered by the apheresis machine into the collected whole blood. It is not to be infused directly into the donor. After the anticoagulant is used, the bag in which it was contained is discarded. When collecting plasma in the RBCP protocol, the plasma is collected into an empty plasma collection bag. One hundred milliliters (100ml) of AS-3 is transferred into one RBC collection bag when using the RBCP protocol or 2 separate bags when using the 2RBC protocol. AS-3 solution provides nutrients to keep the red blood cells viable for 42 days when refrigerated. CP2D is also indicated for the collection of FFP and PF24 plasma, collected and stored plasma collected using the 822, 822-2P and 822F-2P disposable sets may be frozen within 8 hours (FFP) or within 24 hours which includes 8 hours room temperature storage and 16 hours refrigeration storage (PF24). The 300mL AS-3 is used in conjunction with automated red blood cell washing devices. AS-3 serves as the nutrient solution for storage of the red blood cell product after deglycerolization. The red blood cells are washed using the Model 215 System. AS-3 is used for priming the disposable and for the last wash of the red blood cells. The washed cells are then re-suspended in 100mL of the AS-3 before transfer into a product collection bag or storage bag. Additive Solution Formula 3 (AS-3) provides nutrients to keep the washed red blood cells viable for up to 14 days after washing when refrigerated. Neither the CP2D nor the AS-3 container is used for the storage of blood or blood components. The container for all CP2D and AS-3 solutions is a flexible polyvinyl chloride (PVC) bag sized for holding the appropriate amount of solution. The bag has a single port that is used for bag filling. The port is sealed after filling with a male luer assembly (CP2D) or female luer assembly (AS-3). Both the male and female luers are gamma irradiated prior to use. The plastic bag is contained in an overwrap which is added prior to sterilization. containing 15 mEq of Sodium. CP2D Anticoagulant Solution and AS-3 Solution may be used with Haemonetics apheresis devices. See the Haemonetics Operation Manual for full operating instructions. Prior to use of the solutions, check the solutions for leaks by squeezing each of the bags firmly. If leaks are found, discard the solution. Studies of the effectiveness of 250mL CP2D and 250mL AS-3 made by Haemonetics Corporation Union, South Carolina facility included in vivo survival data in healthy subjects at one test site and in vitro characterization of stored red blood cells at three test sites. Haemonetics Clinical Evaluation #95012, involved autologous in vivo recovery and survival studies, and in vitro red blood cell characterization conducted at a single site. RBC results collected with Haemonetics CP2D/AS-3 were compared to crossover controls of manually collected RBCs from the same donors using CP2D/AS-3 made by Medsep Corporation (crossover manual controls). In addition, results were compared to data from other RBC apheresis donors using CP2D/AS-3 solutions manufactured by MedSep (unmatched apheresis controls). Test parameters included hematocrit, hemoglobin, RBC and WBC counts, ATP levels, pH, supernatant potassium, free hemoglobin, supernatant glucose levels, and product weight. The RBC quality of test units after 42-day storage was equivalent or slightly superior to those of the control units. RBCs collected by the two different collection protocols (Red Blood Cells with or without Plasma) showed no significant differences in terms of RBC quality and red blood cells from all groups met FDA and AABB guidelines for 24-hour recovering at 42 days storage. Study #98001 was performed using 250mL CP2D and 250mL AS-3 to confirm, in vitro, the results of Clinical Evaluation #95012. Three test sites each performed three RBCP and three 2RBC apheresis procedures using the MCS+ LN8150 and associated collection sets. In addition, each site collected six manual whole blood units as concurrent (unmatched) controls using Medsep sets and prepared RBCs according to standard procedures. (p<n; 0.05) were evaluated in terms of clinical significance. Differences in glucose or lactate levels, hematocrit, pH, and supernatant potassium were not considered clinically relevant because these parameters have not been found to correlate significantly with the in vivo 24 hour percent recovery. The results from this study confirmed the observations from Clinical Evaluation #95012. The quality of stored RBC products collected by apheresis is similar to RBC products collected manually. A difference in ATP and hemolysis levels, both after processing and on day 42 of storage, for the apheresis units were not statistically significant when compared to ATP and hemolysis levels from manually collected RBCs and were similar to historical reference values. 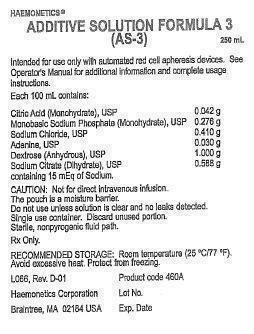 AS-3 300mL was used in conjunction with an automated closed system, the Haemonetics Model 215 (now called the ACP) in Clinical Evaluation #97002. Five test sites were used in this study. 100 samples were tested in vitro and 30 in vivo. Red blood cells derived from CPDA-1 whole blood units were used. AS-1 red blood cells were used as a control. A total of 140 red blood cell units were glycerolized and deglycerolized. The in vitro RBC quality and in vivo RBC viability data obtained on these units demonstrate that red cell units glycerolized and deglycerolized using the Model 215 System and resuspended in 300mL AS-3 solution manufactured by Haemonetics, Union, South Carolina are processed in a closed system and can be stored for 15 days at 4°C. Clinical report TR-CLN-100229-B summarizes a study conducted to support the use of CP2D for the collection of FFP and PF24 (plasma collected and stored Plasma collected using the 822, 822-2P and 822F-2P disposable sets may be frozen within 8 hours (FFP) or within 24 hours which includes 8 hours room temperature storage and 16 hours refrigeration storage (PF24). The following tables provide a summary of the results of this evaluation. Note: Table 1, Table 2, and Table 3 below demonstrate the results of a clinical study conducted for various coagulation factors on plasma that was frozen within 8 hours (FPP) versus plasma frozen within 24 hours, which includes 8 hours room temperature storage and 16 hours refrigeration storage (PF24). As noted in Table 1 below, significant differences were observed between PF24 and FFP for assays Prothrombin Time, Partial Thromboplastin Time, FVIIa, and FVIII. Table 2 provides the results for Plasma Sample A and Plasma Sample B, which were outliers and subsequently excluded from the analysis. Table 3 provides a summary of how many samples tested in each group differed by >20% when FFP and PF24 were compared. *Sample size = 58. The outlier pair was excluded from the analysis based on the statistical criteria or laboratory errors. One sample (Plasma Sample A) showed significantly increased levels for Factor VIIa and F1.2. Another sample (Plasma Sample B) showed significantly decreased level of Factor VIII:C for the FFP sample (Table 2). These data were excluded from Table 1 since the values for VIIa and F1.2 were more than 4 SD from the mean. The factor VIII:C was not more than 4 SD from the mean but was significantly lower in FFP as compared to PF24. While other parameters in this sample did not show significant differences when compared to the control FFP, the FDA could not exclude the possibility that the activation found in the PF24 sample was related to the preparation procedure. The rate of such event occurrence was unknown and, based on review of published values for PF24 products, is most likely very rare. The clinical significance of the elevated markers of clotting activation for transfusion recipients is undetermined. Note: Plasma collected may be labeled as FFP or Plasma Frozen within 24 Hours (PF24). Note: For FFP, the plasma should be placed in a freezer within 8 hours from the completion of collection. The plasma should be frozen at -18°C or colder. For product intended to be labeled as PF24, the plasma should be refrigerated within 8 hours of collection at 1 – 6°C and frozen within 24 hours of collection. FFP and PF24 should be frozen at -18°C or colder. • Solutions are NOT INTENDED FOR DIRECT INFUSION. • Do not use if particulate matter is present or if the solution is cloudy. Note: Some opacity of the plastic container due to moisture absorbance by the PVC during the sterilization process may be observed. This is normal and does not affect the quality or the safety of the product. This white, hazy appearance will diminish gradually over time. This advice only applies to the plastic container. Do not use if the solution itself is cloudy or contains particulate matter. • Do not use if the container is damaged, leaking or if there is any visible sign of deterioration. Note: The over wrap serves as a moisture barrier. Upon removing the solution bag, small droplets of condensation may be present in the packaging. This is considered normal. After removing the over wrap gently squeeze the inner bag which protects the sterility of the solution. Discard if any leaks are observed or if an excessive amount of solution is noted within the over wrap. • Do not reuse solution. Discard any unused or partially used solutions. • Protect from sharp objects. • Verify that solutions have been appropriately connected to avoid leaks. • The set should be loaded and primed for use within 8 hours of the start of the collection. • Carry out the apheresis procedure in accordance with the detailed instructions of the manufacturer of the apheresis device. Donors being reinfused with citrated blood or blood components may experience side effects due to the presence of citrate. Patients being transfused with the blood components could also experience a reaction to the citrated blood components. The major symptom experienced by donors is paraesthesia. Should this occur the reinfusion should be stopped or the reinfusion rate decreased. In the event of inadvertent bolus of the product administer calcium gluconate. Both solutions are intended to be used only with automated apheresis devices for collecting human blood and blood components. CP2D is used as an anticoagulant solution and AS-3 is intended for use a nutrient solution. Neither solution is intended for direct infusion; neither solution produces a pharmacological effect. Both solutions are intended to be used only with automated apheresis devices for collecting human blood and blood components. CP2D is used as an anticoagulant solution and AS-3 is intended for use a nutrient solution. Neither solution is intended for direct infusion. 250mL CP2D Anticoagulant Solution is supplied in flexible PVC containers with a sterile, non-pyrogenic fluid path. 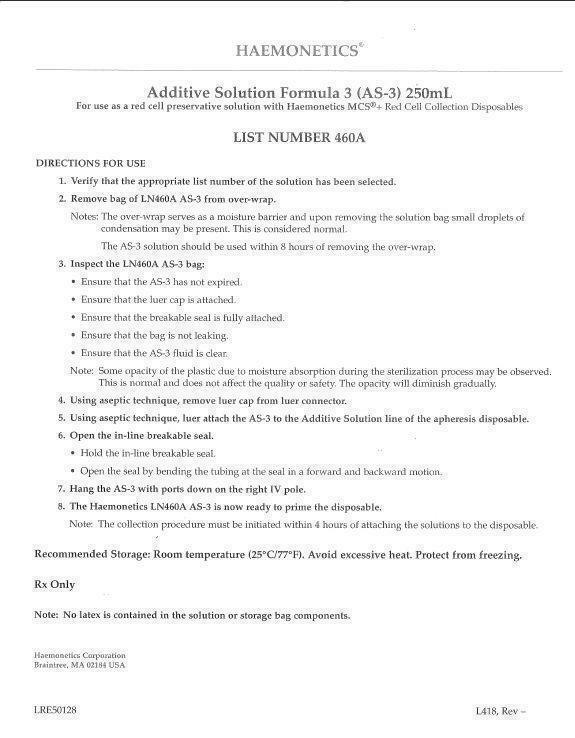 250mL and 300mL AS-3 Nutrient Solution is supplied in flexible PVC containers with a sterile, non-pyrogenic fluid path. Room temperature (25°C/77°F). Avoid excessive heat. Protect from freezing.